To establish a winter playing surface, bermudagrass golf courses are overseeded in early fall with perennial ryegrass (and Poa trivialis on greens). At the typical overseeding time (September to October), growing conditions are still favorable for bermudagrass development. To suppress bermudagrass prior to seeding, an application of Primo Maxx® plant growth regulator one to five days prior to scalping/seeding at 0.5 oz. per 1,000 sq. ft. (0.25 oz. on greens) will help suppress the bermudagrass and allow the overseeding to establish. If using in combination with Reward® landscape and aquatic herbicide to burn down the bermudagrass and reduce the amount of green waste, apply Primo Maxx at least two days prior to the Reward application. At early overseeding dates in September and early October, bermudagrass will aggressively regrow when the Primo Maxx pre-overseeding application dissipates. Primo Maxx can be applied post-overseeding at 0.35 oz. per 1,000 sq. ft. one to seven days after the first mowing, followed by a second application 21 days later (reduce the Primo Maxx rate to 0.2 oz. per 1,000 sq. ft. if growth is slow because of colder-than-normal temperatures). 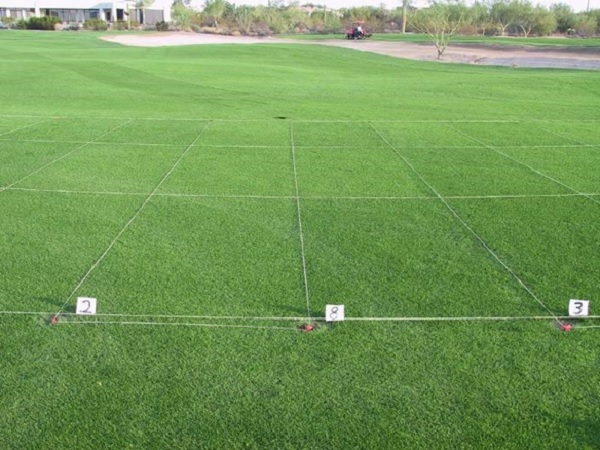 These applications effectively suppress the bermudagrass and greatly improve the density and color of the ryegrass stand (use 0.1 to 0.125 oz. per 1,000 sq. ft. on greens. Poa annua is a winter annual weed in the southern U.S. that effectively competes with overseeded ryegrass. Poa annua may not be readily visible until the plants flower in February or March, which may be too late for any remedial measures. 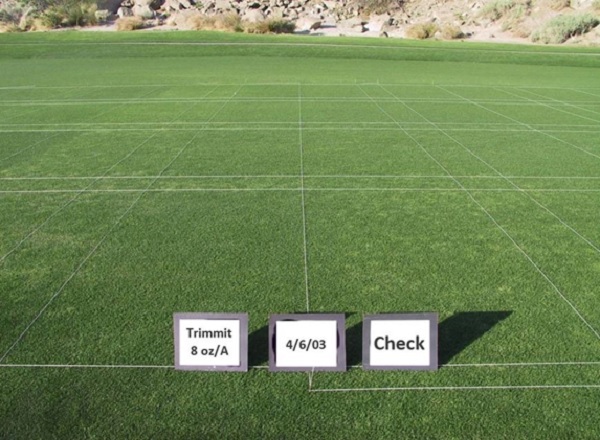 Trimmit® 2SC plant growth regulator will help control Poa annua when applied as an early post-emergence application. Once the overseeding is established (but no sooner than seven weeks after overseeding), applying three applications of Trimmit 2SC monthly effectively suppresses Poa annua. Apply at rates of 8 to 10 oz. per acre while the ryegrass is actively growing, beginning seven to eight weeks after overseeding. 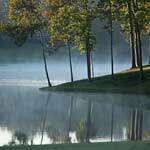 If unusually cold temperatures reduce the ryegrass growth rate, use 6 oz. per acre and/or delay application until ryegrass resumes growth. Picture taken four weeks after overseeding. 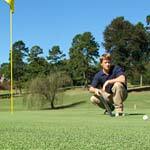 Barricade® 65WG herbicide was applied eight weeks prior to overseeding for Poa annua control. Plot 2 is Barricade at 0.38 lbs. ai/A, Plot 8 is Barricade at 0.5 lbs. ai/A with 0.35 oz. per 1,000 sq. ft. Primo Maxx after first mowing, Plot 3 is 0.38 lbs. ai/A Barricade with Primo Maxx after first mowing. Color and density of ryegrass improved with Primo Maxx after overseeding. Scottsdale, Arizona. Poa annua control in ryegrasss overseeding with Trimmit 2SC. Three 8 oz./A applications were applied monthly beginning in mid-December. Palm Springs, California. 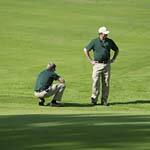 To learn more about using plant growth regulators to protect your turf this fall, download the GreenCast® Turf App from the Apple® App Store or the Google Play Store. 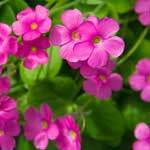 Photos are either Syngenta property or used with permission. ©2018 Syngenta. Important: Always read and follow label instructions. Some products may not be registered for sale or use in all states or counties and/or may have state-specific use requirements. Please check with your local extension service to ensure registration and proper use. Barricade®, GreenCast®, Primo Maxx®, Reward®, Trimmit® and the Syngenta logo are trademarks of a Syngenta Group Company. Apple® is a trademark of Apple Inc. All other trademarks are property of their respective owners.